Spray a slow cooker container with cooking spray. Layer in potatoes, carrots, and onion. 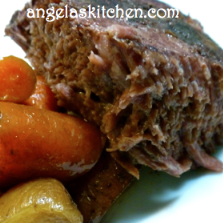 Place beef roast on top of vegetables. In a small bowl, combine stock, Italian seasoning, and black pepper. Pour mixture evenly over roast. Cover and cook on low for 9-10 hours. Remove roast and cut into pieces. Mix vegetable mixture well. For each serving, place vegetables on a plate and top with meat and liquid.